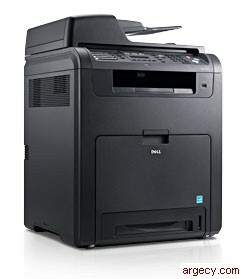 The versatile Dell 2145cn Multifunction Color Laser Printer combines fast, energy-efficient performance with vivid 2-sided output that can conserve resources both in and out of the office. Built to accommodate growing workloads, the 2145cn handles large jobs with ease, while its low cost-per-page output helps to keep you working within budget. The 2145cn combines professional-quality color printing, copying, scanning and faxing in one sleek, easily accessible machine. 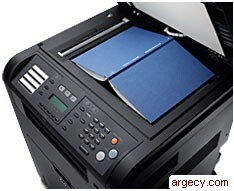 Maximum duty cycle of up to 65,000 pages per month can accommodate your business- growing printer needs. Standard 2-sided printing, copying and scanning (often sold as extras on competing printers) can help to conserve resources and lower office expenses. Dell's -N-Up- feature helps to reduce paper use by enabling the printing of multiple pages on one sheet of paper. ENERGY STAR* and RoHS compliance offer added peace of mind. LDAP support provides easy-to-use scan-to-email functionality. Get up to 5,500 pages (black) and 5,000 pages (color) from the 2145's high yield toner cartridges*, and set up Dell's Toner Management System - to alert you before toner runs out.